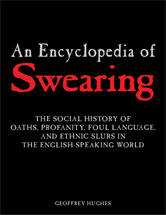 This is the only encyclopedia of the social history of swearing and foul language in the English-speaking world. It covers the various social dynamics that generate swearing, foul language, and insults in the entire range of the English language. While the emphasis is on American and British English, the different major global varieties such as Australian, Canadian, South African, and Caribbean English are also included.